Pictured above, left to right: Sterling Branch Manager Steve Kaiser, Sedgwick County FFA Advisor Catie Appelfeller, Sedgwick County FFA chapter members, and Sterling Loan Officer Andy Piel. 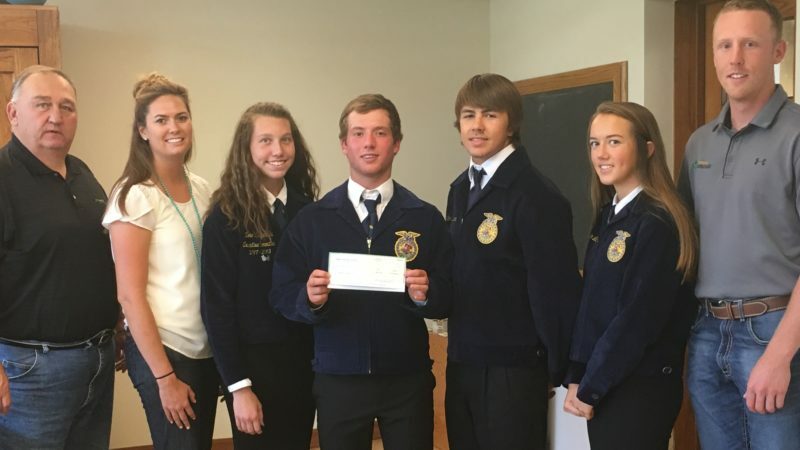 Premier and CoBank have partnered up to support a new and exciting venture the Sedgwick County FFA Chapter has taken on. The chapter was recently gifted a 5-year lease on 160 acres of dryland farm ground. The students in the chapter, led by their advisor and an advisory board, will be gaining real-life farming knowledge through this venture. As the chapter took stock of what they needed, it became apparent that operating funding was a priority. Advisor Catie Appelfeller reached out to Premier’s Sterling Branch Manager Steve Kaiser, who with the help of Loan Officer Andy Piel, Vice President of Credit Ryan Rasmussen and Vice President of Marketing Jaimee Mollohan took stock of what Premier had to offer. The end result was a financial donation from both Premier and CoBank to help the chapter get started, as well as a commitment from Premier to provide financial guidance, classroom financial education and feedback on quarterly financial updates on the chapter’s farming venture. We look forward to what the future brings for this exciting venture.